Another year, and another Christmas Eve morning spent at Beautiful Feet! I blogged about my experience last year, and how that made an impact on me. This year was pretty much a repeat, and while I don’t want to rehash all that, I do want to blog about a particular moment during that Christmas Eve morning that stood out to me. We had already sorted clothes and everyone was downstairs helping serve that “Thanksgiving-esque” meal graciously cooked by my brother Knights of Columbus. Space was tight with all the tables filled. Some of the homeless decided to eat at the tables outside, which was totally fine because the weather and sun outside late in the morning were quite beautiful! I decided to walk outside too just to see who all was hanging around outside. I stumbled upon some of my parish peers engaged in conversation with this elderly woman. I didn’t catch some of the beginning parts of that conversation, but I caught on and started paying attention when she started talking about the Virgin Mary. And. How. Much. She. Loved. The. Virgin. Mary. So I guess she started giving a sort of life story and how Mary has given her strength and hope through her difficult times. Listening to her, we found out that she was in an abusive relationship, her now ex-husband molested their granddaughters, she used to be a cocaine addict, she’s been assaulted physically, she currently lives in a homeless shelter, her teeth were knocked out by one of her relatives, many other homeless people don’t like her and will throw things at her, and I’m sure she covered other sad events. But what really threw me off and intrigued me was how she endured all these traumatizing things by keeping close to our Blessed Mother. She had learned how to pray the Rosary way back when, and she had a sort of conversion moment upon praying it. And since then, she’s been devoted to the Virgin Mary! She said something about how praying the Rosary keeps her sane while dealing with the craziness of her homeless life. What throws me off the most is how freakin’ excited and joyful she was in expressing this love for the Virgin Mary. I didn’t really sense sadness from her even as she explained her dark past. Haha she was even showing off her Rosaries and Mary medals and all this other Mary-related stuff she had on her! And I really liked how she told us that she knows the Franciscan Friars of the Renewal who live down the road. Not only that, but how she utterly begs them for their ginormous Rosaries that they carry around with them! Haha, made me llol (literally laugh out loud). Anyway…You see, I don’t think most Catholics even understand some of these concepts of what the Church teaches about Mary. And she was here…telling us all this…and how her life relates to it all…with such joy and hope! So, I was definitely amazed and impressed. Because of her past and need for physical and spiritual healing, I felt called to give her the green scapular I had in my wallet (lately, I try to keep scapulars and Miraculous Medals with me to hand out). 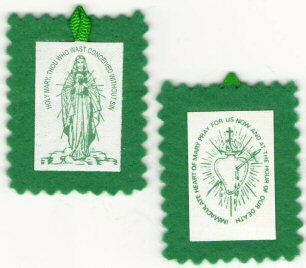 The green scapular is a devotion Our Lady revealed to a French religious sister named Sr. Justine Bisqueyboro in the mid 1800’s. It centers on Mary’s Immaculate Heart, and the prayer that should be prayed daily is, “Immaculate Heart of Mary, pray for us, now and at the hour of our death.” The fruits of this devotion can be help in the areas of physical health, peace of mind, and spiritual conversion. After I gave her my green scapular, my youth minister friend gave her a brown scapular which is a totally different devotion with different fruits. She so was grateful that we gave her these scapulars, and she pretty much took it as a sign. She said that these were amazing gifts for Christmas. Then she went on her merry, joyful way. Towards the end, I got pulled away to help bring in more donated food into the building. But I couldn’t help but be amazed at her joyful hope. She was so incredibly happy when she left, and that was really awesome to see! Geez, she seemed so happy even as a homeless person. I find difficulty in finding us who live in suburbia oozing with the kind of joy and hope she had. 1818 The virtue of hope responds to the aspiration to happiness which God has placed in the heart of every man; it takes up the hopes that inspire men’s activities and purifies them so as to order them to the Kingdom of heaven; it keeps man from discouragement; it sustains him during times of abandonment; it opens up his heart in expectation of eternal beatitude. Buoyed up by hope, he is preserved from selfishness and led to the happiness that flows from charity. 64 Through the prophets, God forms his people in the hope of salvation, in the expectation of a new and everlasting Covenant intended for all, to be written on their hearts. The prophets proclaim a radical redemption of the People of God, purification from all their infidelities, a salvation which will include all the nations. Above all, the poor and humble of the Lord will bear this hope. Such holy women as Sarah, Rebecca, Rachel, Miriam, Deborah, Hannah, Judith, and Esther kept alive the hope of Israel’s salvation. The purest figure among them is Mary. 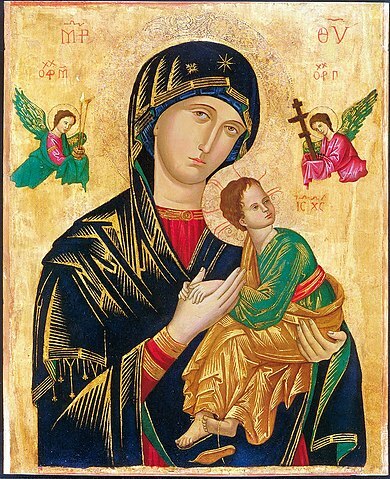 So in that short 10-minute conversation with the elderly homeless woman, I gained a better appreciation for the power of hope and how Mary can strengthen that hope. Without a doubt, the hope of heaven through Mary (through Jesus) is sufficient enough to sustain her, and it is definitely a blessing to have witnessed someone en fuego for the faith like her. Please pray for her, that she may receive healing from her physical and spiritual sufferings and for her to find not just a house, but a home. And also pray for people of good will, who find it in their hearts to help our less fortunate brothers and sisters. If I remember correctly, her real name is Tammy, but her street name that she goes by is Maria Cristo. Wow! That is incredibly beautiful. We can learn so much from those that are considered poor or outcast by society. She is truly rich in ways that we cannot understand. I know, right? Her richness is overflowing because she has the one thing.like Mary, sister of Martha, from Luke.